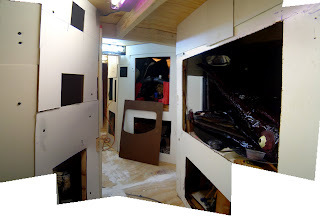 I'm getting closer to finishing the project as all the paneling is complete for the entire attraction. 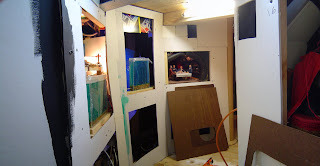 I started out with cutting heavy cardboard or matte-board for all the main paneling. They're all screwed in, so they can be removed for heavy maintenance. On these boards, I cut holes for quick access panels, so I don't have to take out a bunch of screws if I need to do any quick adjustments. 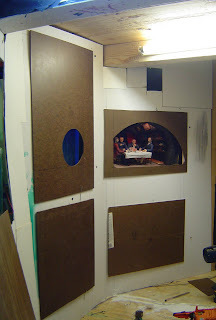 I made these quick access panels out of masonite and they fasten on with wire hooks into holes on the panel boards. All of the viewing windows were done the same way. 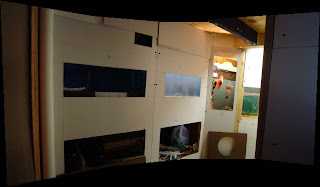 The windows were cut in a way so that the scene is cleanly cropped and makes the scene look nicer and more convincing (especially for all the underwater scenes where you can't see all the equipment). 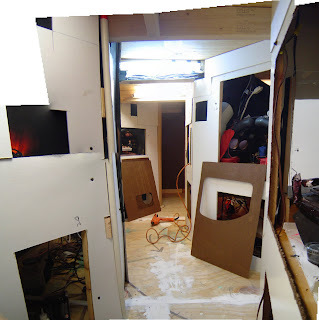 Once all the paneling was installed, the entire project was given a coat of flat black paint. It's really hard to believe it, but I can't believe how much darker the paint makes the project. (For some odd reason, it actually makes it look larger too. Seeing everything one shade of color really makes it look slick and clean, and it's really cool only being able to see the scenes only. I don't have any time for adding Nautilus motif around the walls, but I like being able to see nothing; it allows me to hide all of my flaws too. The next step is to get all the caption books done, which I'll probably discuss next update. I'm also going to get the squid fight finally finished (hopefully!) and some other neat stuff like signs and rope lights. Then from there it'll be adding last minute details and testing and adjusting. Next week will probably be my last scheduled update! By December 10th, I'm calling the project done! Although some elements were put aside, I may pick them up later on when I have more time. Since I've been ultra busy with school finals and stuff, don't be too surprised if I delay next weeks update for a week.